Our Method – Les Bébés Amphibies Int. You can’t always be there so the aquatic safety and swimming skills taught by Les Bébés Amphibies may save their if ever they were to fall in the water, but do not forget no one is drownproof! Les Bébés Amphibies puts safety skills first, followed by water enjoyment and ultimately proficient swimming. Once your infant, toddler or child has completed our aquatic safety program, you will continue with age-appropriate lessons with a maximum of 4 babies in the water at any one time. The instructor will work with each child individually, then the child will repeat the exercises with the parent in the water. Our Instructors are fully qualified in aquatic safety and swimming skills, have a Pool Emergency Procedures Certificate and have received a CRB check. Due to working individually with each child and parent we can adapt each lesson to your child’s needs, and children with special needs can be catered for. Each level is designed to enhance previously learned skills, bringing your child to the next swimming level, and achieve our goal of safe, happy, technically sound swimmers. Les Bébés Amphibies International believes every baby and child should know how to save themselves if they were ever to fall in the water alone as it only takes seconds for a fatal accident. For that reason our aquatic safety training is first on the list, with drowning still being the third highest cause of accidental death among children in the UK, at Bébés Amphibies we teach vital safety techniques from birth, so that babies are at home in the water. 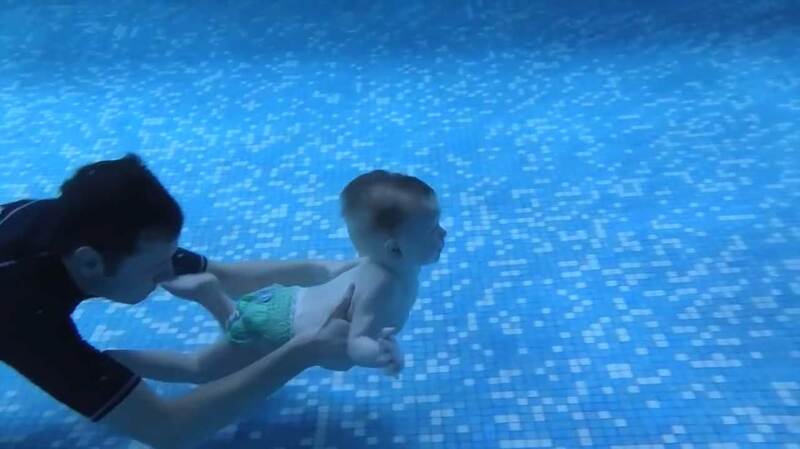 In this first level your baby/child will learn how to jump or tumble into the water, go under water, re-surface and turn on to their back to stabilise and float. Once they can do this the next stage will be to teach them to do this fully clothed, including shoes and a winter coat, they learn to float like this for up to 20 minutes – depending on the age of the child. 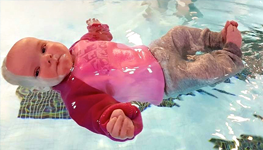 Babies have a natural affinity with water, and they possess incredible natural reflexes in water: at Bébés Amphibies, we work with these to develop your child’s confidence and skills in the pool. Babies have an automatic reflex of which stops them from breathing in water through their noses, when submerged into water, this allows them to keep their mouth wide open any water goes into their stomach and not into their lungs. There’s a pattern to the way babies learn and the way their little bodies develop, and our lessons are all designed with this in mind. Babies have natural reflexes, we use these reflexes to teach them how to move around and swim. Babies learn very quickly and recognise word association and repetition and are soon able to recognise short commands of which we use to teach them to go underwater and to learn to swim on top of the water. Each child is taken individually by our instructors who are fully qualified in teaching Aquatic Safety and Swimming Skills without buoyancy aids. Our teachers must have a nationally recognised, mainstream teaching qualification then they must attend “The Bébés Amphibies Int.” Training Course which involves a minimum 30 Full days in the pool. The parent will then be asked to repeat certain exercises during their lesson. In Bébés Amphibies’ lessons there will be maximum of 4 babies per teacher in the water at any one time. All babies must always be accompanied by one of their parents or a responsible adult over the age of 18. Children need to practice their new skills to maintain confidence and improve them. Your child has learned the survival skills and now its is time to start learning to move around the pool. Movement levels are an aquatic adventure that will change your child from a survival swimmer into a happy swimmer that can’t wait to get in the water, and perhaps even to a competition swimmer. Movement level is educative, teaching your child to move around the pool and get out alone. In this level we have a maximum of 4 children per instructor, all babies and children must always be accompanied by one of their parents or a responsible adult over the age of 18. In this level the child will learn to jump in, dive in, fetch rings off the bottom alone, swim under water, swim – float – swim. Children who can swim and float are able to make the transition into stroke development with ease. To keep the fun in swimming by combining beginning elements of backstroke and freestyle with the activities used in movement classes. This builds on the skills and comfort previously acquired in our one to one levels of Bébés Amphibies Aquatic Safety, Movement & Autonomy levels. Coordinate arms, legs, body in breast stroke, front crawl, backstroke. Using our techniques, our students truly learn to “swim like little dolphins”. 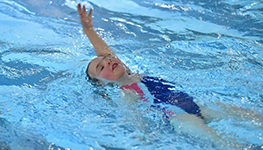 As children become proficient in backstroke, breast stroke and front crawl we begin introducing the elements of old English backstroke and butterfly.